Size: Plate is only 2.4 inches tall! This is an extremely rare Keichousaur fossil. It is a complete baby Keichousaurus hui from China. 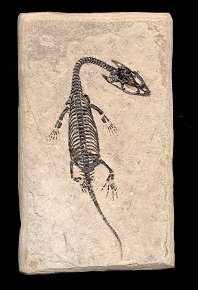 Baby vertebrates, especially Keichousaurs, are rare in the fossil record. This specimen has great detail for being a baby. Usually, babies do not have the finger bones and teeth fully intact. This specimen has good development on both of these features, and they display very well. All the individual ribs and vertebrae are intact and tightly articulated. In fact, the entire specimen has very little, if any, disarticulation present. And the skull is one of the most detailed we have ever seen - adult or baby. Overall, this is one of the most detailed and intact baby Keichousaurs ever found, with NO RESTORATION WHATSOEVER. It is a very collectible, TINY "infant" reptile fossil.